I’ve got things sprouting in the porch. Little alien claws which swelled when soaked are now layered in a pot, hopefully doing their rooty thing – but I guess I’ll find out in ten days time when I tip them out to investigate how well they’ve managed to shoot their tentacles, prior to planting them in a cold greenhouse. Funny how such unprepossessing beginnings turn into beautiful flowers. 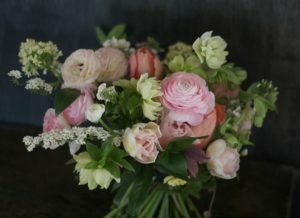 Ranunculus are one of my favourite spring flowers with their ruffled petals and amazing colour palette – from vibrant yellows through to blush and white, they come in every shade (except blue) I could ever want to add a bit of wow to arrangements in the cooler seasons of the year. I get quite excited to see them coming back on stream grown as a commercial glasshouse crop in the UK at this time of year, just when the dahlias, the other stars of the late season garden, are turning black and mushy with the arrival of the first frosts. Ranunculus seem to know that it’s perfect timing to make their entrance, stage left, rather than competing for the limelight with such blowsy divas who shout a bit louder. Not only are these cousins of the humble buttercup beautiful in a bouquet, they are surprisingly tough and resilient out of water – making them perfect candidates for flower crowns and buttonholes or other arrangements without the support of a water source. Their size (that of a modest rose) also means they are ideal to adorn lapels, hair and wrist corsages, and makes them a really versatile and valuable flower for winter and spring weddings, substituting well for roses when brides want to use only British grown flowers during the colder months. Can’t wait for mine to get going for wedding flowers and bouquets next spring….